Android users can now choose one mode of public transport to show on Google Maps instead of having to sift through several. The update, Google Maps for Android version 6.10, lets you pick whether you want to see train, bus, tram or underground information on the map rather than just showing them all. This will make life easier in big cities where all four transport types are available in a small area. Station pages have had a bit of an overhaul to display more information including departure times and the distance to nearby stations. As well as the public transport updates, the Android app will also now highlight the borders of a region you search for, with a couple of tweaks to My Places and the addition of a Local History dashboard to boot. 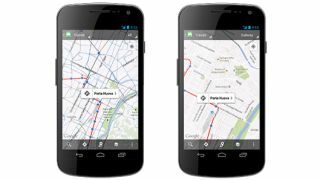 The Android-friendly upgrade comes as Google celebrates the fact that it now has over one million transit stops mapped in over 500 cities worldwide. There's no word on if or when the nifty new additions will make it to Google Maps on other platforms.